About me: My name is Kathy Gyoerick. I began offering pet daycare/boarding services in 2013. I come from an administrative background originally, but have over 10 years of experience working directly with animals. 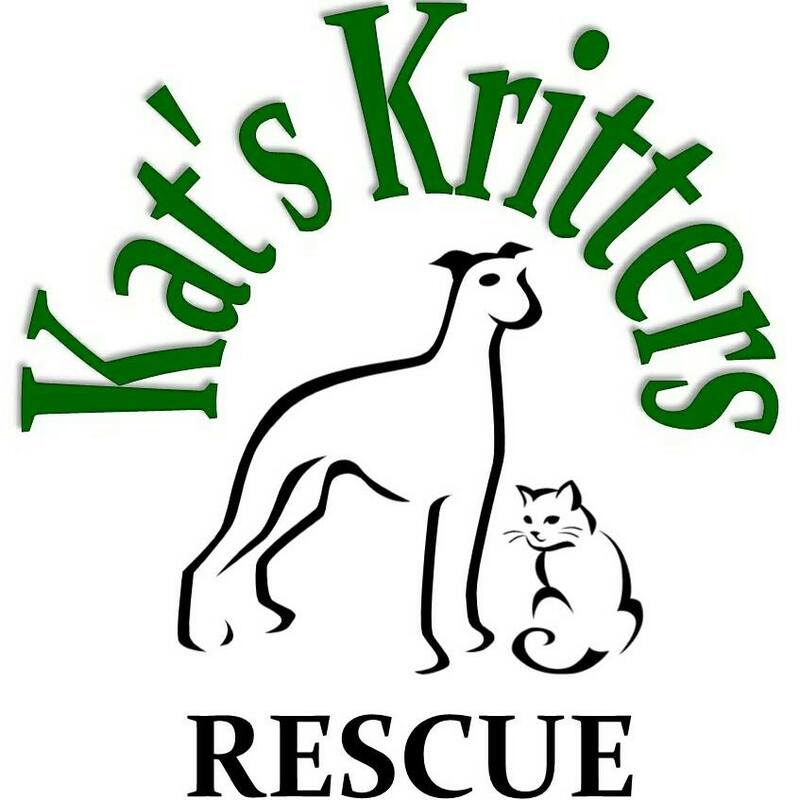 I managed the local humane society for 3 years prior to founding my own animal rescue, Kat’s Kritters Rescue, which I have been operating now for 5 years. I have taken courses in animal science and veterinary assisting. I currently have 4 dogs of my own (2 rough collies, a bulldog mix, and an american eskimo mix) and 2 cats! 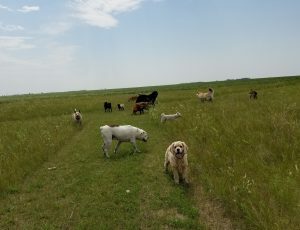 I offer pet daycare/boarding services from my rural home/property south of Sperling, MB. My goal is to provide an environment that makes your pet feel at home. 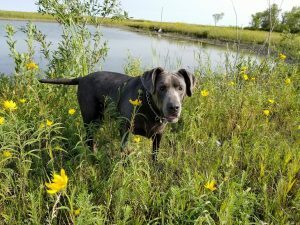 I want your pet to enjoy their stay and have a good time just being themselves in a cage-free environment. I do my best to keep your pet happy and to ensure their visit is as stress-free as possible. I strive to offer a more home-like experience and provide the type of environment I would desire for my own pets! 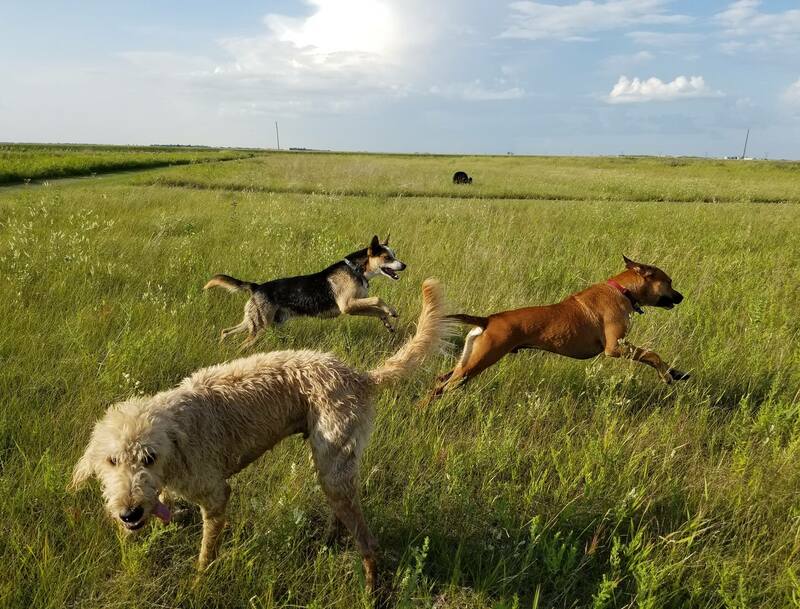 Pets are allowed to express normal behaviour such as running, playing, digging, exploring, and getting dirty all in a rural, enriched by nature environment. Please review the information below and feel free to contact me at katskrittersmb@gmail.com with any questions or to make a booking! Please note that space is limited because I work alone, and also operate an animal rescue from the same location, so can only accommodate as many animals as I can safely handle. Note: All rates are subject to 5% GST. Note: The rate charged for BOARDING is per DAY (not per night). Depending on the time of drop off/pick up, daycare rates may be charged on those days instead. A basic bath and towel dry can be arranged for your dog on the day of pick up. This service is not available during very busy times, and is only available if your dog is easy to bathe and not stressed by the process. The request for a bath must be made at the time the booking is made to ensure time for this is scheduled for the day of pick up. I will offer a discounted rate per day for boarding multiple pets from the same household at the same time. a $5 per day discount will be offered for all animals adopted through my Kat’s Kritters Rescue. This discount is a lifetime discount on all daycare and boarding services. A minimum of 48 hours notice is required to cancel a booking. If you cancel a booking less than 48 hours in advance of a scheduled drop off appointment, you will be charged 50% of your pet’s full stay. You provide your own food, medication, and specialty treats (ex. hypoallergenic, if required) for your pet. Regular treats are readily available! If possible, please bring food in a sealed container. There is no additional charge for administering medication. Please do NOT bring your pet’s food/water dishes. I will provide the required dishes. If your pet requires feeding from a slow feeder/puzzle feeder, just let me know and I will make sure to provide their meals in your preferred way. Please make sure your dog is wearing a secure collar at the time of drop off and is on leash. Prong collars, bark/electronic “training” collars, and retractable leashes are not permitted. All cats must be in a secure carrier. Please advise IN ADVANCE if there is any important information regarding health or behaviour that you feel I should know so that I can plan accordingly. *Please note that at this time I am not able to accommodate boarding or daycare for dogs that have exhibited aggressive behaviour towards other animals. 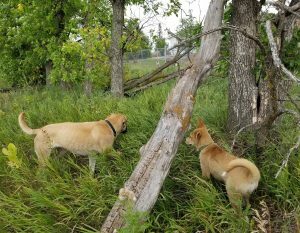 Dogs must be friendly and well socialized with other dogs. *All dogs over 8 months of age must be spayed or neutered. I cannot accommodate female dogs in heat. *All animals must be current on vaccinations, including rabies. Puppies and kittens must have had a minimum of 2 rounds of vaccinations. Bordetella (kennel cough) vaccination for dogs is suggested, but is not required. If your pet cannot be vaccinated for health reasons then a note from your veterinarian is required. *A copy of CURRENT vaccine records must be provided. This can be emailed in advance, or brought along at the time of drop off. *Please make sure your pet is parasite free and is on appropriate tick/parasite prevention. I offer my daycare and boarding services from my rural home, located on an 8 acre property. 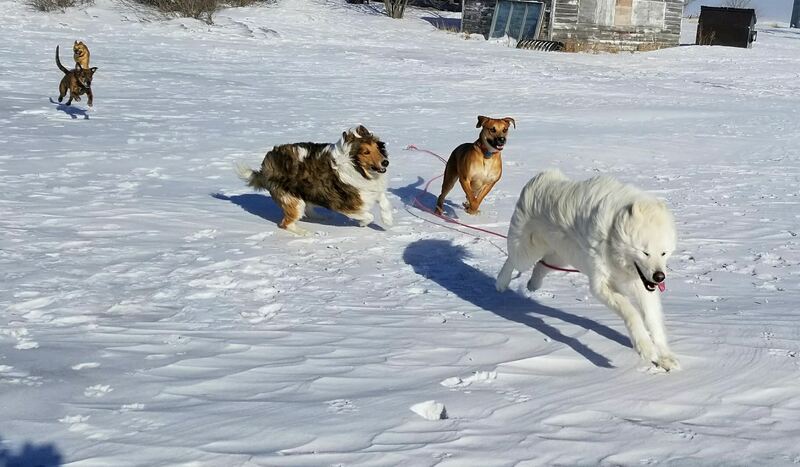 I may not have a fancy facility, but many happy dogs can attest that they don’t care a bit! 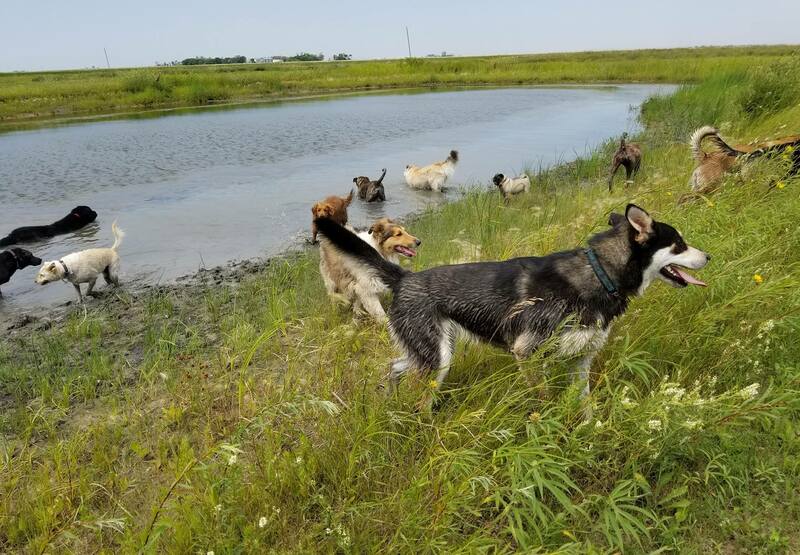 My location offers many options for the dogs to have an enjoyable experience where they can just be dogs! 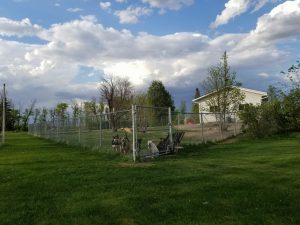 There are multiple fenced areas and all fencing is 6 foot high, commercial grade fencing. 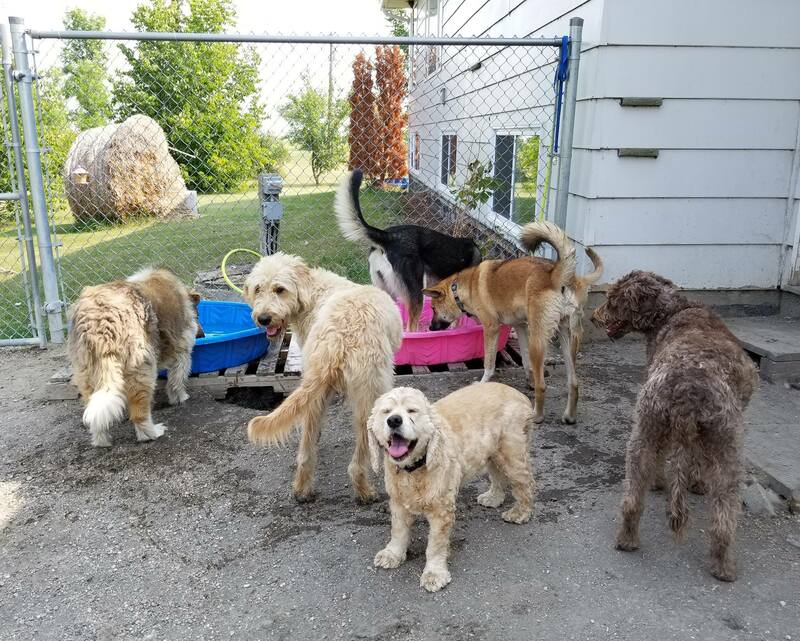 Because I offer cage free boarding and daycare, dogs will spend the majority of their time with other dogs. 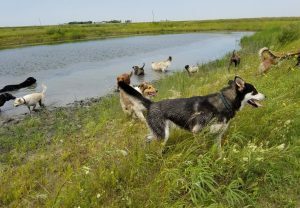 Dogs that are trustworthy off leash can also join on supervised walks exploring the entire 8 acre property which includes a large pond. Walks/bike rides in the surrounding rural area, when weather permits, may also be provided. 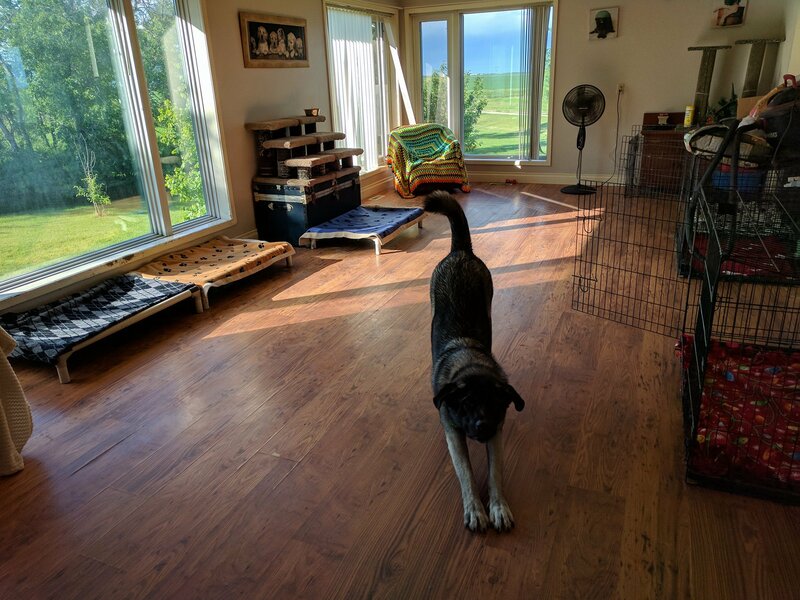 In the house, the dogs have access to the main floor and multiple sleeping and play areas are available. The dogs can come and go freely for the majority of each day from the house to the attached fenced area via doggy doors. 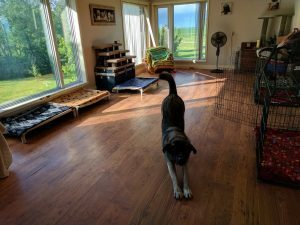 I do also have a few separate areas in the house blocked off where I can separate dogs during brief times that I cannot directly supervise, or if a dog requires some space or quiet time. These areas are also used for senior or special needs dogs during their stay. **Dogs spend almost all of their stay in the company of other dogs. This type of boarding is not suitable for all dogs. 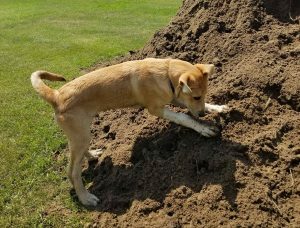 If your dog is very timid, easily overstimulated, or can be reactive around other dogs, cage free boarding may not be the right fit. Social, easy-going dogs thrive best in a cage free boarding type of environment. *Please advise in advance if your pup has problems with other animals (either cats or dogs) so I can plan accordingly. *Please note that at this time I am not able to accommodate boarding or daycare for dogs that have exhibited aggressive behaviour towards other animals. I can offer suggestions for other boarding facilities should you have a dog that would do better in a more controlled environment with less interaction with other dogs. *In any situation where animals are allowed to house together and interact with one another, there is risk of injury. Rough play, etc. can lead to scratches, ear nips, etc. 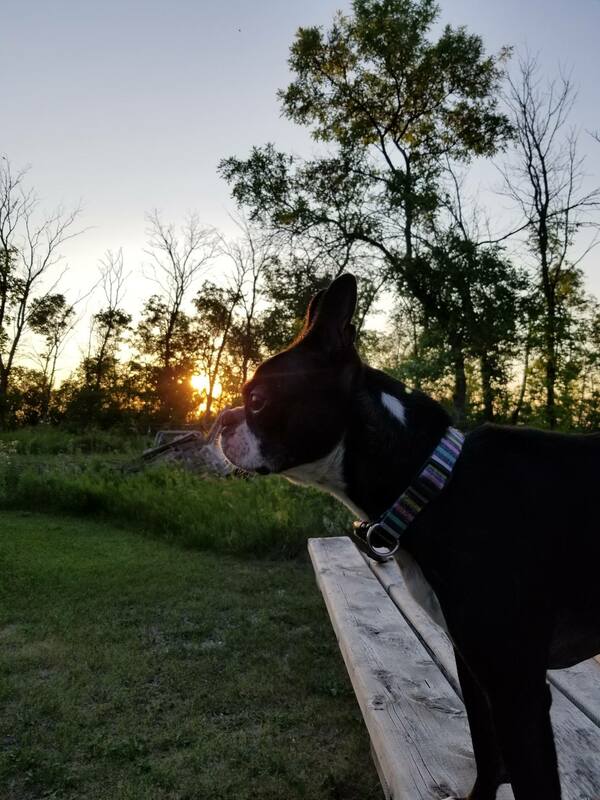 While care is taken to minimize all risks, and any problems are addressed promptly, please make sure you understand that there are certain risks involved in choosing to board in a cage free boarding type facility. Cats are given free range access to a large room with multiple windows. The room is equipped with furniture, scratching posts, toys, litter boxes, etc. They will receive daily attention and playtime. *Please note that space to board cats is very limited. 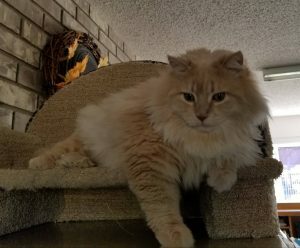 For those with social cats that are not easily stressed, and if you are willing for your kitty to share space with other cats during their stay, I can be more flexible. During your pet’s stay, I will regularly post photo and/or videos to the Facebook page facebook.com/katskritterspetdaycareandboarding. You are also welcome to text message (204-745-7842) and or email for updates. I may not always be available to respond immediately to update requests, but I will reply as soon as I am able. 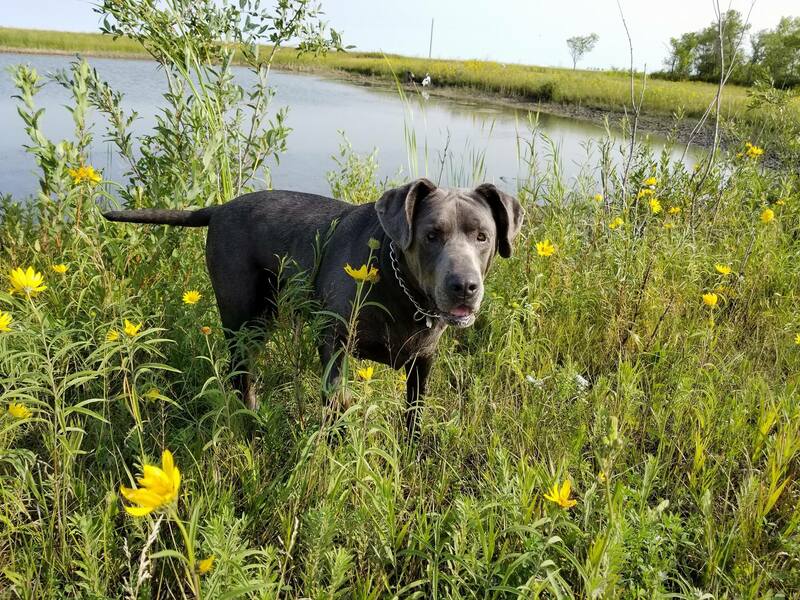 *New in 2019 – Digital copies (without the watermark) of any of the photographs of your pet posted on the Facebook page can be purchased and emailed to you upon request for $0.25 each or 5 for $1.00. Proceeds all donated to Kat’s Kritters Rescue. On the documents you will be required to complete, you can indicate your preference for your dog’s sleeping arrangements. There are a variety of options available, including in my bedroom with me, free range in the house, in a confined area/space, or in a crate. *Please do NOT bring your dog’s bed or crate. I will provide whatever is needed and have every size of crate imaginable if you prefer your dog be crated. Important: A booking will not be confirmed without both a drop off and pick up time scheduled at the time the booking is made. Drop off and pick up times are a scheduled appointment and are not approximate. *Note: When dropping off your pet, it is preferred that drop off be as “fuss-free” as possible and is not prolonged. The other dogs on site are often very excitable whenever someone enters the property, which can be overwhelming for a new dog, and the transition is much smoother for all involved if drop off is short and sweet 🙂 If it is your dog’s first time, I have a very specific procedure in place that begins as soon as you leave and involves me spending time alone with your dog first, to help them get used to me and to the property. This also allows time for the other dogs to settle down. 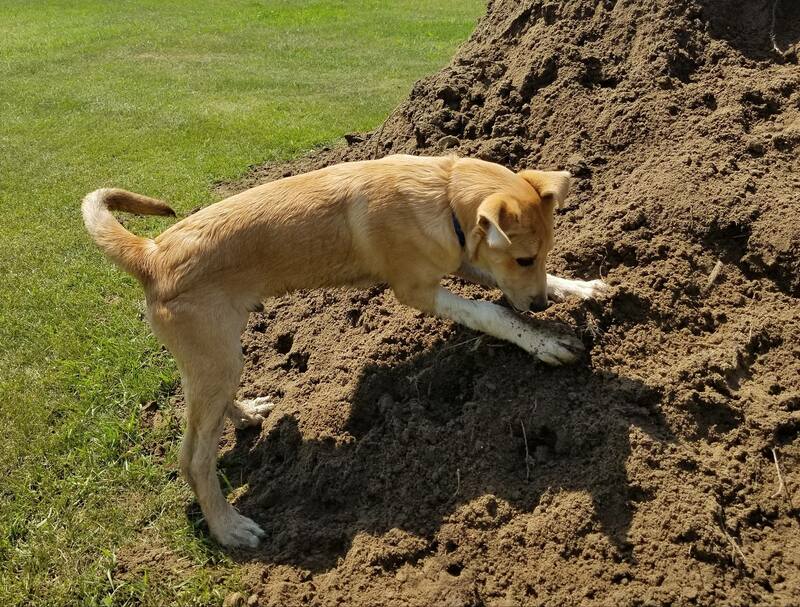 I then will introduce the new dog to my own dogs and then to any other dogs on site. This process can take some time, so please make sure to arrive on time for your scheduled drop off so that I can commit the full time that I will have set aside to making the experience as positive as possible for your dog. I try to be as flexible as possible regarding drop off and pick up times between the hours of 7:00AM and 8:00PM (Mon-Fri) and 8:00AM and 9:00PM (Sat-Sun), but do require a minimum of 24 hours notice so that I can schedule my days. A $5 per 15 minutes charge will be automatically added to your bill for all late drop offs/pick ups. Chronically late clients may be refused service in the future. Drop off and pick up times can be rescheduled provided the change is requested at least 24 hours in advance. Requesting a change in a scheduled drop off/pick up appointment less than 24 hours before the currently scheduled appointment will result in a $5 per change fee. Please note that due to other appointments that may be already scheduled, not all requests to change a drop off/pick up time can be accommodated. 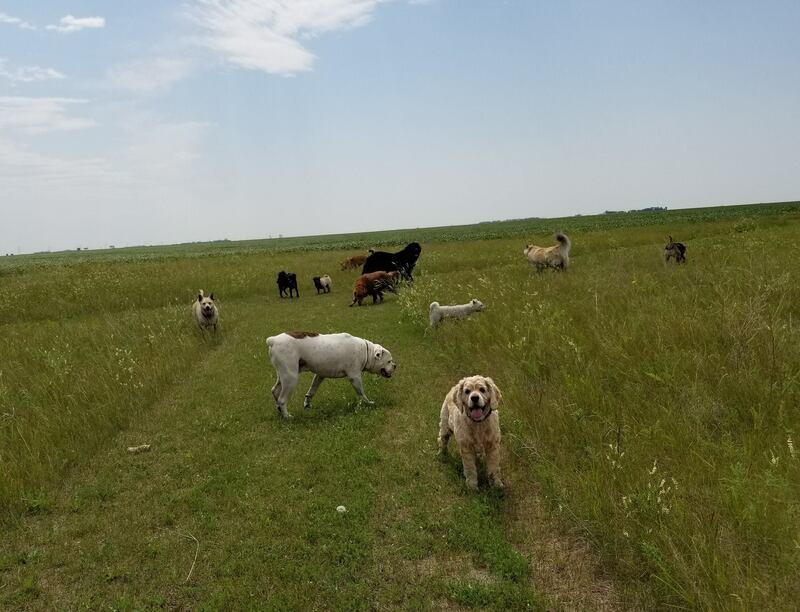 I operate from my home/property south of Sperling, MB. My location is easily accessible from both Hwy #3 and Hwy #23. From Hwy #3, you turn south at Sperling onto provincial road 336 and go south for 5 miles to road 29N. Turn east onto road 29N and go 1/2 mile. The lane marker is 10062. From Hwy #23, you turn north onto provincial road 336, which is approx. half a mile east of Kane. Go north on 336 for 5 miles to road 29N. Turn east onto road 29N and go 1/2 mile. The lane marker is 10062. There are TWO separate forms that need to be completed (an application and a waiver) for EACH pet and MUST be brought along at the time of drop off. These forms will be emailed to you when you contact me to arrange to book a stay for your pet. Please complete the forms IN FULL and ensure they are completed before you come. They only need to be completed once and then stay on file, unless changes are required. Please review them carefully. Your pet will not be accepted for daycare or boarding without these completed forms. *Please note that the physical address on the top of the form has not been updated to the new location. The correct physical address is the Sperling address as described above. If you are ready to proceed with a booking, or have any questions about the information provided above, please EMAIL katskrittersmb@gmail.com.